On Friday last week, Ven. 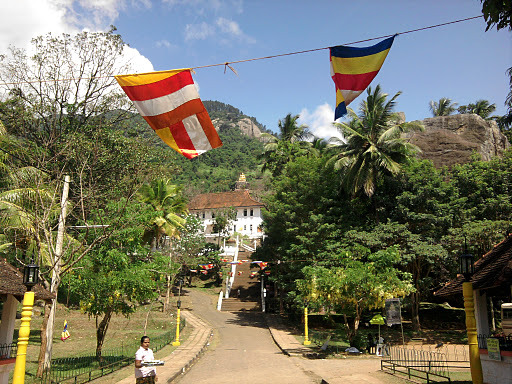 Nyanatusita and I took a bus from Kandy to Matale and visited the Aluvihare Rock Temple. 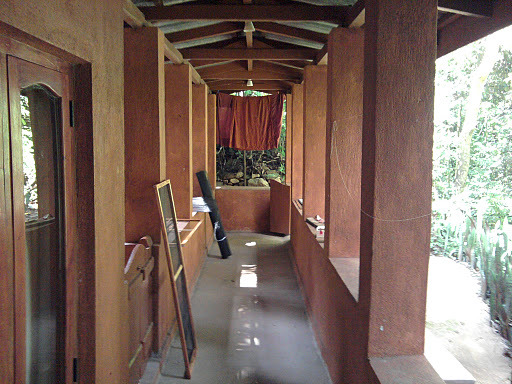 There were some interesting paintings and caves converted into small buildings. 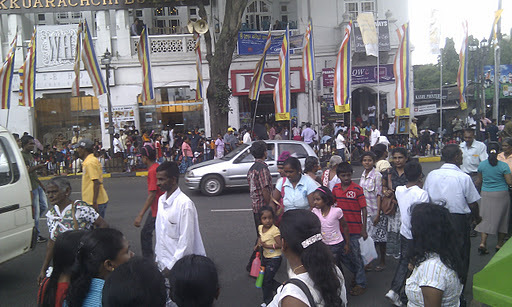 Many Sri Lankan pilgrims and a few foreign tourists were walking around. 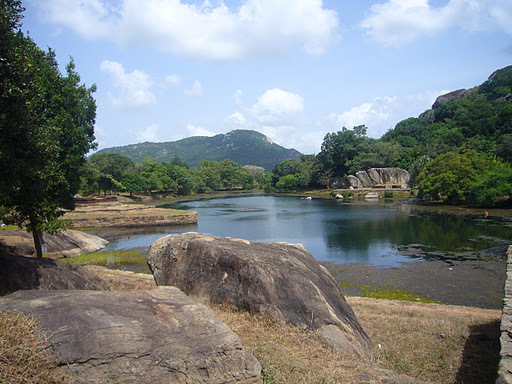 After walking around, we ate lunch and then took a bus north to Dambulla where we thought we might be able to climb the hill to see the cave paintings. We arrived around 2pm in the hottest part of the day. 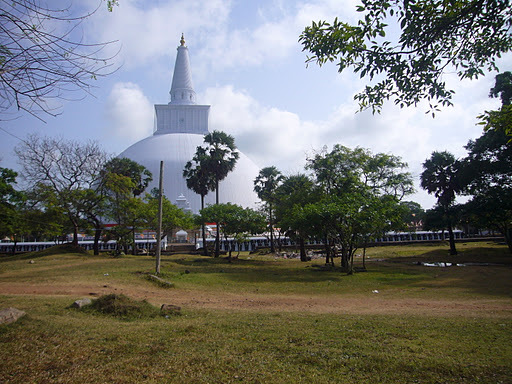 There were many pilgrims perhaps returning from the Poson Poya (possibly the most significant uposatha day in Sri Lanka – Thursday, 16 June 2011) celebrations in Anuradhapura and Mahintale. We heard a report that there were over 5000 Sri Lankan Police Officers mobilized to monitor over 1,000,000 pilgrims. We decided to visit the Dambulla caves another day and walked across the road to drink tea at the “Tourist Welfare Center”. 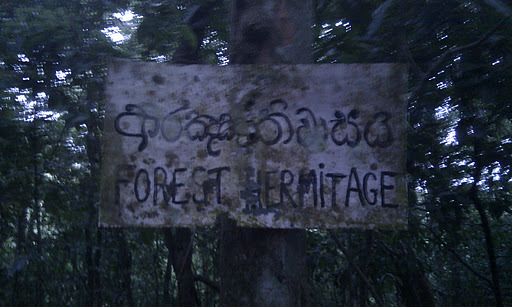 We then rode a three-wheeler towards Sigiriya stopping at a national park where we walked around inspecting the remains of an ancient meditation monastery. I was very impressed with this place. It was quite overgrown in many parts and the paths not clear. 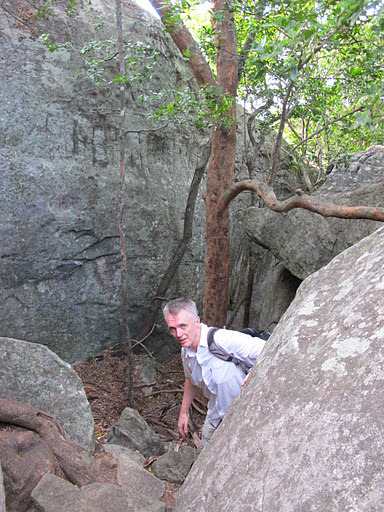 We explored many old cave sites and found evidence of kutis being built hanging between large boulders. I felt inspired and imagined the ancient Sangha living on the site possibly over many hundreds of years. After 2-3 hours we got back in the three-wheeler and continued on to the Pidurangala Temple located at the base of a large granite hill 800m north of the more famous Sigiriya. 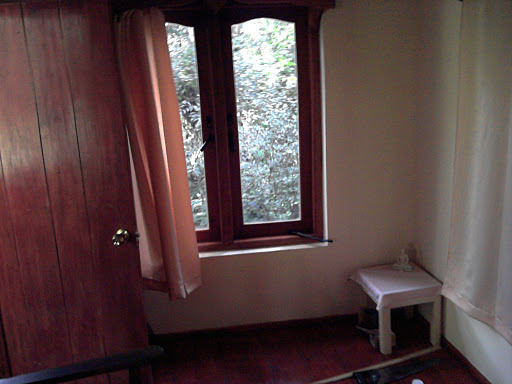 The young pirivena monks allowed us to stay the night in the dusty local village headman’s office including an ensuite occupied by many varieties of local frogs. 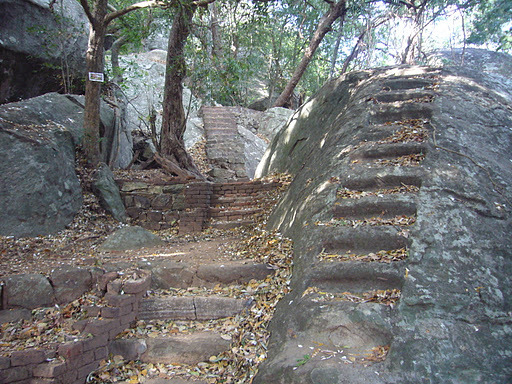 On Saturday morning, we climbed the stairs to view various cave kutis (meditation huts) and ruins. Unfortunately none of the kutis were occupied. 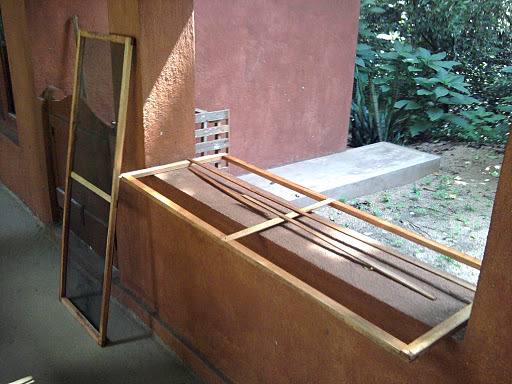 Though looking well built on the outside, the kutis stank of bat faeces and needed repairs. We doubted any meditation monks would like to live there now because of the steady traffic of curious tourists and pilgrims walking by. 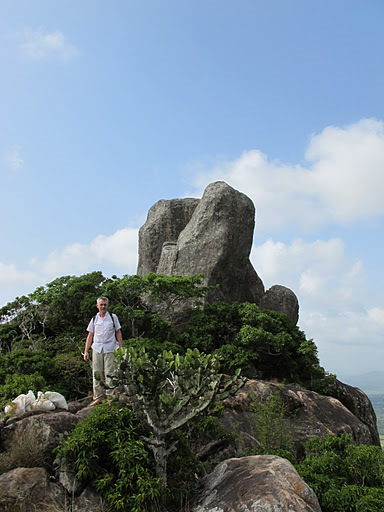 We climbed up the hill and through some boulder strewn areas to reach the flat peak. 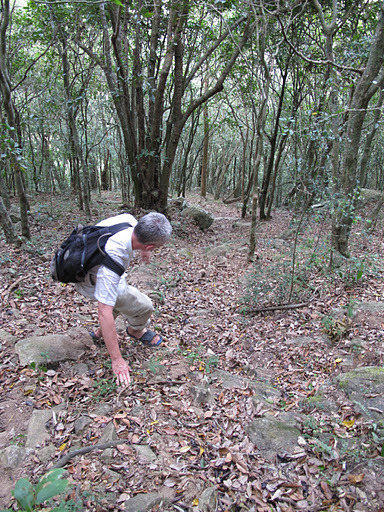 I didn’t see the easy way at first and took a rather dangerous and steep climb with no supports. 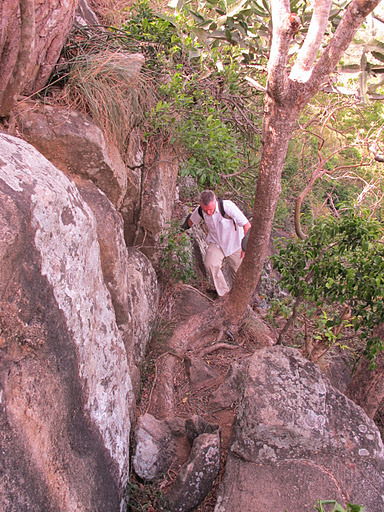 We passed a young English woman on the way up who also later climbed the hard way. After a false start, I expressed respect for mutual bravery. 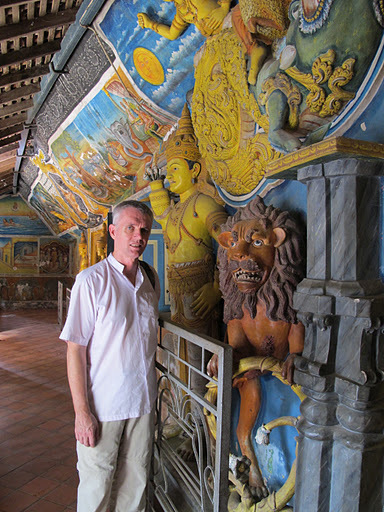 Shortly afterwards some Sri Lankan people and more foreigners arrived (the easy way). The top of the hill is spectacular. The winds were gusting strongly and could be dangerous for people near the edges. There are no railings so visitors must take care. It is best to go early in the morning or late in the afternoon to avoid the heat of the day. The rock would become very hot. 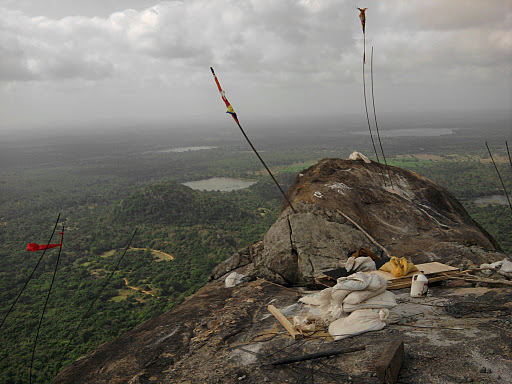 We could see nearby Sigiriya and in the distance also see the hill with the Dambulla cave temple. 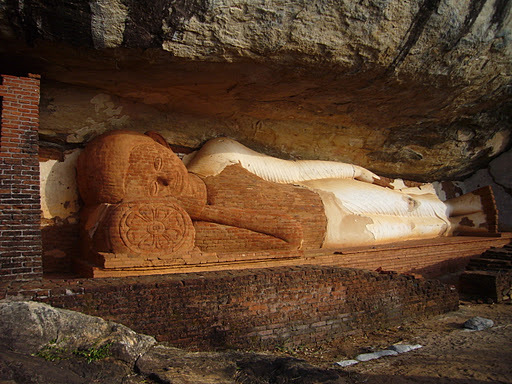 A restored reclining Buddha statue at the ancient ruins of a monastery near Sigira, Sri Lanka, June 2011. 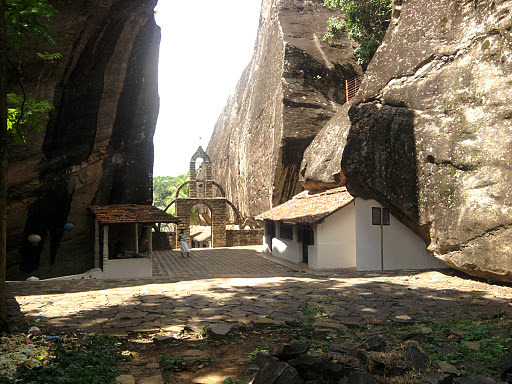 A view looking north at a monastery near Sigira, Sri Lanka, June 2011. 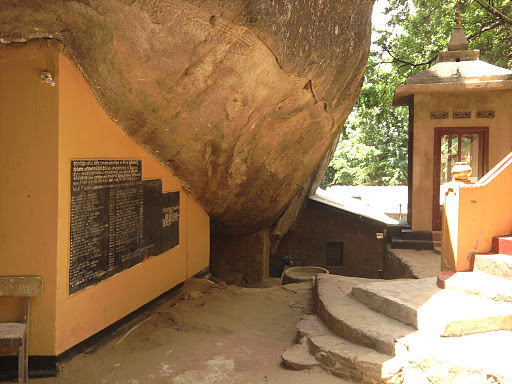 The kuti under the rock in the photo was built over 20 years ago and abandoned. 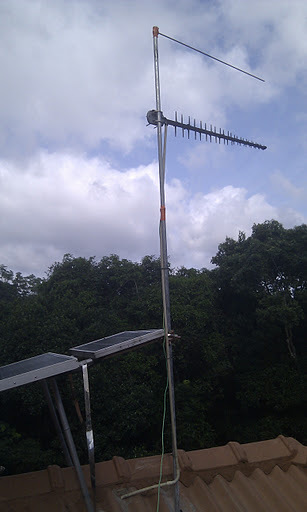 It is now inhabited by bats. 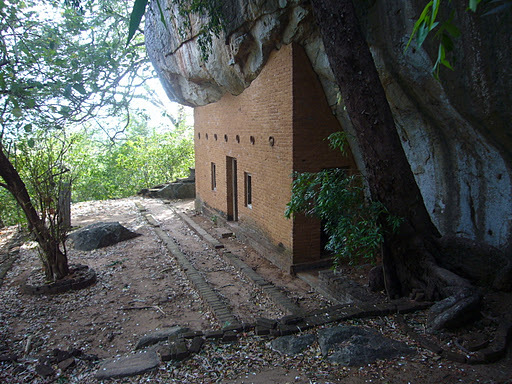 The central buildings of a monastery near Ritigala, Sri Lanka, June 2011. The building on the left is used as a dining hall and is built under a large boulder. 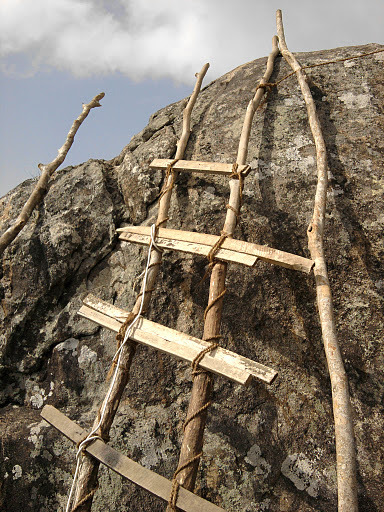 A makeshift ladder near the top of a hill where the local Ritigala monks wanted to build a stupa, Sri Lanka, June 2011. 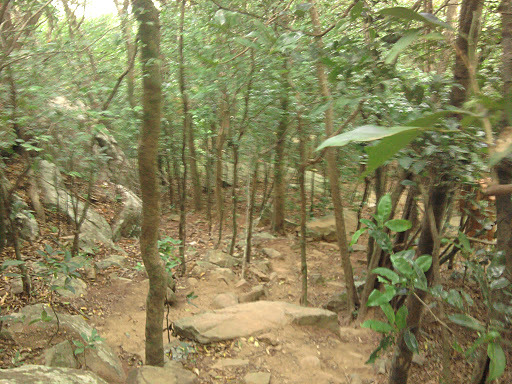 A rough path on the side of the hill where the local Ritigala monks wanted to build a stupa, Sri Lanka, June 2011. This section of the path is relatively easy to walk on. 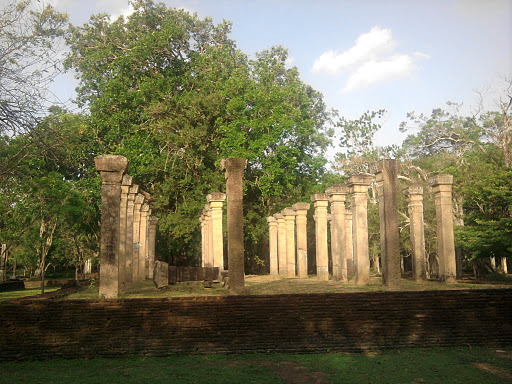 Some ruins at Abhayagiri monastery, Anuradhapura, Sri Lanka, June 2011. 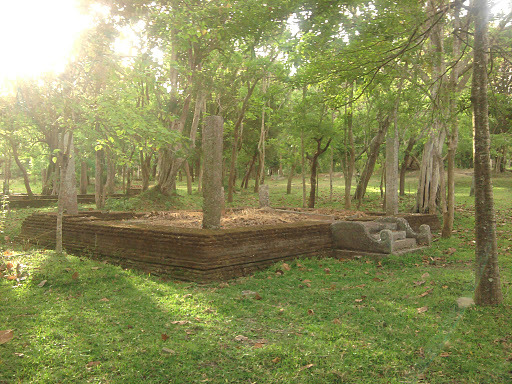 The restored elephant tank at the ruins of Abhayagiri monastery, Anuradhapura, Sri Lanka, June 2011. 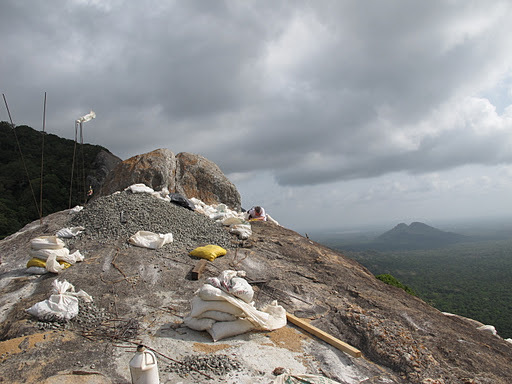 Restoration work at the Abhayagiri stupa, Anuradhapura, Sri Lanka, June 2011. There are probably 30-40 monkeys not quite visible in this photo, climbing around the framework and making a lot of noise. Restoration work at the Abhayagiri stupa, Anuradhapura, Sri Lanka, June 2011. 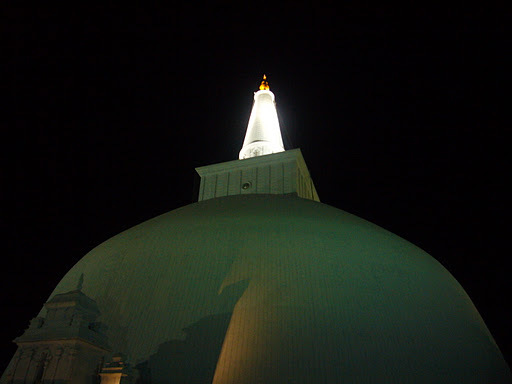 The Great Stupa at night, Anuradhapura, Sri Lanka, June 2011. Michael sensed something very special about this stupa. 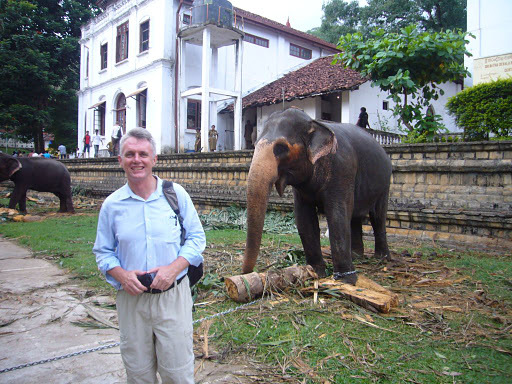 I got safely back to Kandy last night (Wednesday) around 9pm. The 100km ride from Dambulla at night was thrilling. The fare was about 60 cents each with front seats to a rally car race in which out bus was participating. I’ve done it before in Thailand but this was perhaps more intense. I just let it happen and enjoyed the ride and the psychedelic light show above the dashboard glorifying various Buddhist and Hindu deities. Many cyclists with no lights and chaotic traffic weaving in and out, sudden stops and turns. Bald tires, soft suspension and bouncy seats set to a sound track of falsetto vocals and deep bass drums etc. At the second last town the bus filled beyond capacity and I had to keep my arms out to stop people sitting or falling on me. All a memory now. I’m flying to London on Monday 27 June. Not long now. I’ve been sort of preparing by downloading travel guides for England and Scotland and even reading the text of Macbeth which I hope to see performed at Stratford Upon Avon sometime in July or August. Maybe England first in early to mid July and then Scotland in late July-August. Note: I didn’t get around to writing this posting in as much detail as I’d planned. I encourage readers to research this issue and (electronically) sign the petition. There is room for you to leave comments on the petition form if you wish. 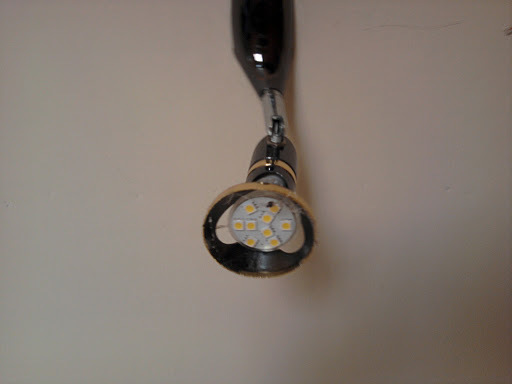 Here is an on line document related to the peititon with back ground information that you may find interesting. I hope the Government of Nepal can create more employment and develop industry for the economic prosperity of its people. I can’t see any factories nearby Lumbini on Google Maps. There are many farms nearby. I remember the roads all around are narrow and very poor quality with many pot holes (probably created by cement trucks). The Nepal Government is already aware of the sensitivity of this area and has responded to international pressure by preserving this World Heritage area many years ago. There has been a lot of international funds (Japanese and Taiwanese etc.) invested at the site and the Nepal Government agreed to move an old Hindu temple that had been built on top of the Buddha’s birth spot. The old carving of Queen Mahaamaaya giving birth to the Bodhisatta was interpreted wrongly by later Hindus as a Hindu goddess so they built a Hindu temple around it. Now the Hindu temple is moved to another location and the birth site preserved as a sacred Buddhist site. Though now it is less sacred than it is an archaeological site, where many Hindu and Muslim tourists pass through every day, laughing and joking. 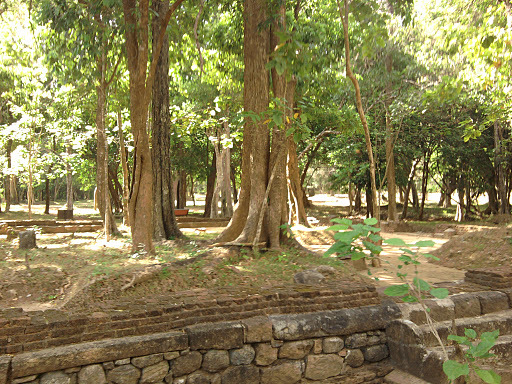 Most of these Buddhist sacred sites in India and Nepal are preserved as large parks with lots of grass and trees. International funding for gardeners and walls and ticket offices are helping this. 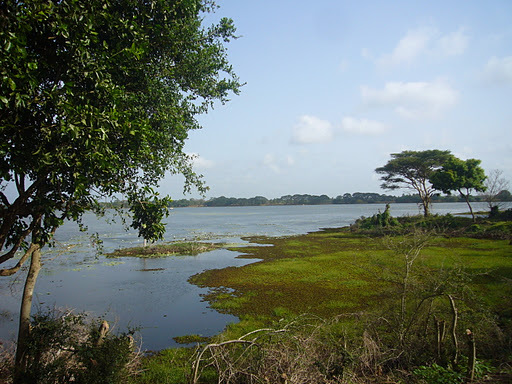 Then the locals use these places as recreational parks for family picnics and romance. I saw it with my own sad eyes. 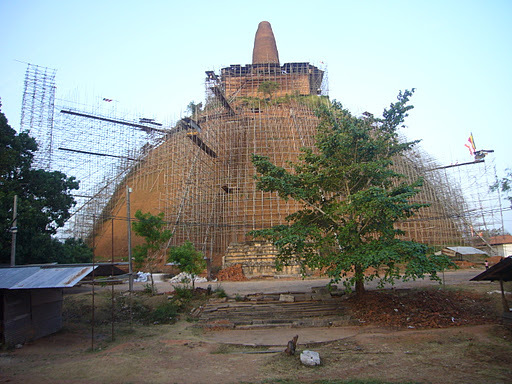 There is even graffiti on stupas such as the Dhamek Stupa in Sarnath (Isipitana) where the Lord Buddha set the wheel of the Dhamma rolling with the first Dhamma talk (Dhammacakkhapavatana sutta) to the first five disciples (pancasaavakii) . 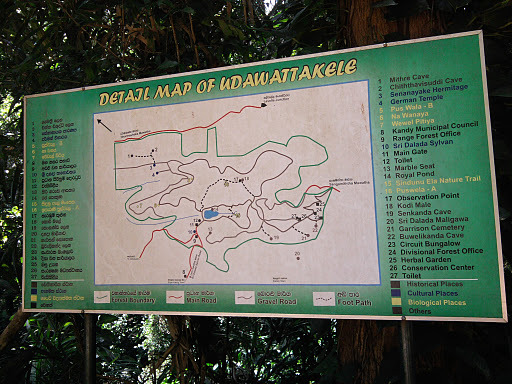 Foreigners must pay about US$5 to enter these parks while locals pay about 20 cents each. 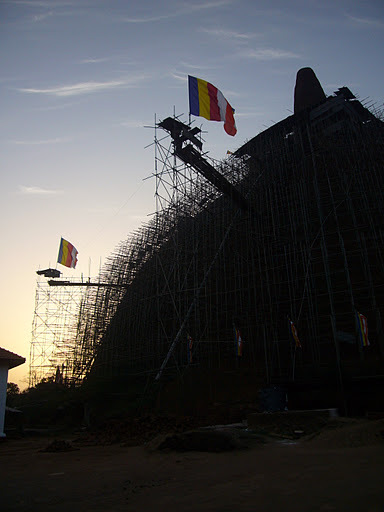 I went to Lumbini in December 2009. From memory there appeared to be more dust and pollution from deforestation than any factories. There seemed to be a lot of soil erosion in the area. It is not mountainous in this southern part of Nepal, very close to the northern border of India. This whole area was once verdant with forests. Locals use wood for fuel to cook and heat their houses. Hindus also burn wood as part of their rituals for fire worship. Now with massive population increase due to better food and medical facilities (though these are still very bad compared to many other countries), there is great demand for resources. 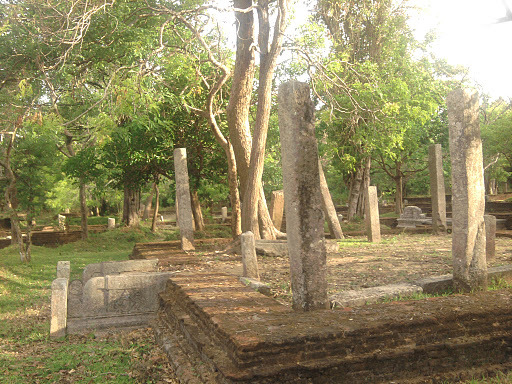 The column on the left is an Asoka pillar. The white building is a steel framed structure sheltering the birth spot of the Buddha Gotama. There is a tank in the foreground and behind the photographer is a large Bodhi Tree. The ticket office is outside the frame to the right. 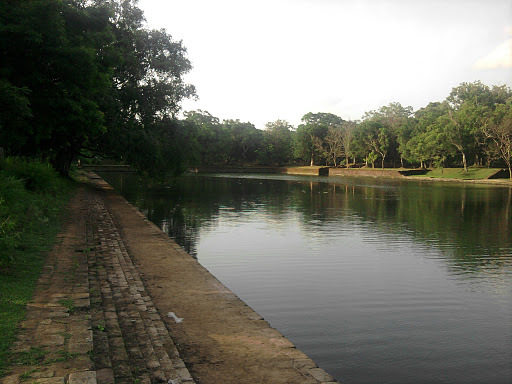 I wrote about my experience visiting this place in December 2009. I doubt this petition will help the people of Nepal or prevent the decline of Buddhist parks and sacred sites. All these places will disappear sooner or later. 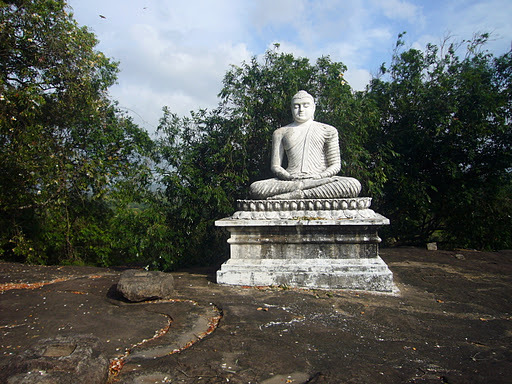 It is dhamma – conditioned phenomena. Try not to be too attached to them. It is better to work for your own salvation and the well being of living people. It may be that with some better living conditions and a better environment, Nepalese and Indian people can learn to appreciate their heritage. Maybe not though. Australians don’t appreciate Australian heritage very much. 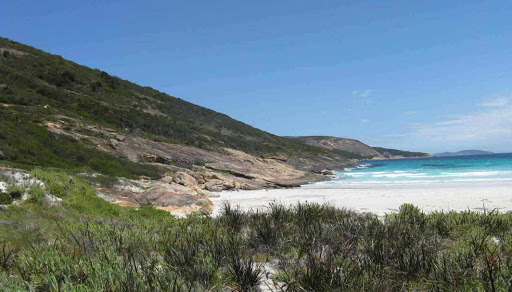 Little is done to preserve Aboriginal culture. Sacred sites are bulldozed for mines and railways. This sort of thing happens in every country. There is also a danger that instead of taking real world political action, many people sitting at home will feel comforted by signing a petition safely in Australia or Canada far from the suffering of the Nepal and Indian people. I’m not sure that signing petitions such as this counts as ‘socially engaged Buddhism’. 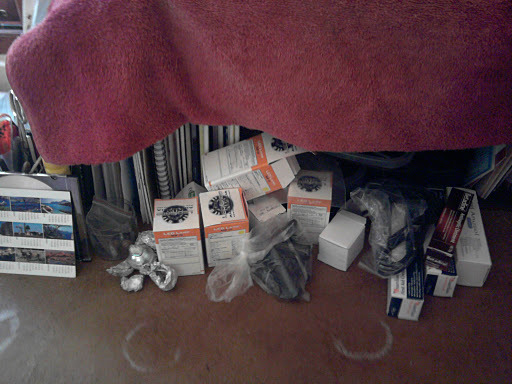 However, it may be the beginning of a more active involvement. Even so, I signed the petition and encourage you to also sign. Perhaps if many people sign the petition there maybe change for the better. I quote below half of a sutta from the Sutta Nipaata with a reference to Lumbini as the birthplace of BuddhaGotama. I don’t quite like the style of the translation – it is a bit archaic and may be difficult for ESL people to understand. I changed a few phrases but tried not to interfere too much. The numbers in square brackets refer to the verse number. The published translation also included Paali text in Roman characters that I have not reproduced in this blog. Seeing the prince, like a crested flame all ablaze, clean as the spotless moon, the lord of the stars, the sky roamer, and shining like the sun in the autumnal sky free of clouds, he, overjoyed, gained immense delight. The rest of this sutta refer to Ven. Naalaka’s conversation with the Blessed One.